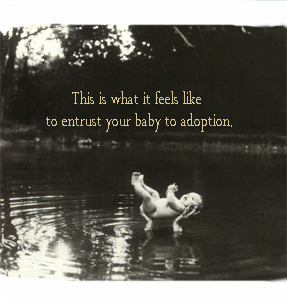 This picture rings especially true for birthparents in closed adoption, who are not allowed to know where their children are, what they look like, or how they are doing. But it also represents the grief that's present even in the most fully open adoptions. The underwater placement of the adult figure can symbolize many things to an open adoption birthparent: the shame and scorn heaped on birthparents by an uncomprehending society; the perception of uninformed outsiders that a "good" birthparent fades away, never to be heard from again; and the fact that, no matter how open an adoption is, we are still not in our children's lives in the way that we would wish to be. Finally, the sacrificial part of adoption is shown in this picture, wherein the birthparent undergoes deep and lasting pain in hopes, not always realized, of bettering the life of the child.